Unit for the Rehabilitation of Victims of Torture (URVT) is a specialised unit to assist victims of torture by providing them with multidisciplinary treatment and rehabilitation services. It was launched in 2006 and runs since under Future Worlds Center. URVT is currently funded by the UNVFVT (United Nations Voluntary Fund for Victims of Torture). Unit for the Rehabilitation of Victims of Torture’s (URVT) mission is to support and promote the empowerment and rehabilitation of people who have been subjected to torture, inhumane, degrading treatment or punishment in their country of origin and/or in Cyprus. Victims are mainly refugees and asylum seekers, and at times victims of trafficking. URVT’s aim is to assist victims and their families to rehabilitate and to integrate into the local society. URVT adopted a holistic approach to rehabilitation offering a full range of services, including psychological support and rehabilitation; legal counselling and assistance throughout the asylum procedures; and social counselling during the rehabilitation process. The URVT team works alongside the UNHCR funded project Strengthening Asylum. URVT also works on raising awareness among the local community on torture related issues. URVT operates according to the standards of the Istanbul Protocol - United Nations Manual on the Effective Investigation and Documentation of Torture and Other Cruel, Inhuman or Degrading Treatment or Punishment - and its services are offered to the beneficiaries by specialised, experienced, and well-trained personnel. URVT runs under the Humanitarian Affairs Unit of the Future Worlds Center. The Unit for the Rehabilitation of Victims of Torture (URVT) is a project, which aims to support and promote the empowerment and rehabilitation of torture victims and victims of trafficking who are asylum seekers or persons granted with international protection status in Cyprus and to assist them to integrate into the local society. To that end it takes a holistic approach, offering medical and psychological care, legal advice and social assistance to the persons of concern and their families. Its services are facilitated through a structure designed on the standards of the Istanbul Protocol - United Nations Manual on the Effective Investigation and Documentation of Torture and Other Cruel, Inhuman or Degrading Treatment or Punishment and its services are offered to the beneficiaries by specialized, experienced and well-trained personnel. URVT furthermore works closely with a network of volunteer service providers, medical professionals and interpreters. Modeled after the Medical Rehabilitation Center for Torture Victims (MRCT) in Athens, the Cypriot URVT was established in June 2006 as a collaboration between the Greek MRCT and the Cyprus Neuroscience and Technology Institute (CNTI), a non-profit, non-governmental organization established in Cyprus. URVT currently operates under the Humanitarian Affairs Unit of Future Worlds Center, (legally registered as CNTI). One of the most important beliefs of the Future Worlds Center is that by befriending and understanding people of different cultures, backgrounds and experiences, the future world becomes a better place. URVT’s integrated treatment approach encompasses a full range of services including medical treatment, psychological support, legal counseling, and other social services. URVT works closely with a network of volunteer service providers, medical professionals, language and cultural translators to help victims of torture and their families rebuild their lives. URVT has treated 81 victims since its establishment. The Manual on Effective Investigation and Documentation of Torture and Other Cruel, Inhuman or Degrading Treatment or Punishment, commonly known as the Istanbul Protocol is the first set of international guidelines for documentation of torture and its consequences. It became an official United Nations document in 1999. The Istanbul Protocol is intended to serve as a set of international guidelines for the assessment of persons who allege torture and ill treatment, for investigating cases of alleged torture, and for reporting such findings to the judiciary and any other investigative body. "...torture is defined as the deliberate, systematic or wanton infliction of physical or mental suffering by one or more persons acting alone or on the orders of any authority to force another person to yield information, to make a confession, or for any other reason." (World Medical Association, Declaration of Tokyo, 1975). The Unit for the Rehabilitation of Victims of Torture is dedicated to helping victims of torture and their families rebuild their lives, regardless of race, national origin, religion, gender, sexual orientation, or economic or legal status. Who is a victim of torture? For our purposes, a victim of torture is anyone who has experienced any form of torture, which is defined as "any act by which severe pain and suffering, whether physical or mental is intentionally inflicted on a person for such purposes as obtaining from him or a third person information or a confession, punishing him for an act he or a third person committed or is suspected of having committed, or intimidating or coercing him or a third person." Victims of torture in Cyprus are mainly asylum seekers. Hence, their protection and needs are met mainly by the Cyprus Refugee Law 2000. In accordance to the Refugee law as well as Cyprus' EU and International obligations the element of torture must be examined and taken into consideration when examining an asylum seeker's application for asylum. The victims that are treated by URVT are asylum seekers and persons granted with international protection status, and are referred to us by the Asylum Service or the Reviewing Authority for Refugees, Ministry of Interior, which are the competent authorities that examine asylum claims. The referral is based on an obligation stipulated in the Cyprus Refugee Law (Article 15) according to which when an applicant claims torture or where it is suspected that a person is a victim of torture or in the case where there is strong indication that a person is a victim of torture, the competent authority must refer him/her for medical examination. Currently referrals for medical examination are brought before a Medical Committee, which consists of public doctors. After it is certified that a person is a victim of torture then he/she is referred to URVT for rehabilitation. URVT also offers rehabilitation services to asylum seekers or persons granted with international protection status, who are victims of trafficking. Torture victims arriving in Cyprus are mainly, Kurds from Turkey, Kurds from Syria, Syrians (Arab), Iranians, Palestinians. We have also had cases from Cameroon, Sierra Leone and Pakistan. URVT follows the definition on torture and the procedures as stipulated in the Istanbul Protocol. If you are unsure if you have been a victim of torture, please contact us for further information. We will not turn anyone away. Medical services are provided on a weekly basis to our clients by our specially-trained doctor who is educated in issues relevant to the care of torture victims. In urgent cases or when special medical screening is necessary, clients are referred to public hospitals or private volunteer specialists in the community. A lawyer informs asylum seekers, refugees and torture victims of their rights and supports their asylum claims. Our legal staff also helps our clients appeal against previous rejections of asylum applications. A psychologist who specializes in the needs of torture victims is available for one-to-one counseling on a weekly basis. A social history is documented after an interview with the client by a social worker. The aim is to help integrate the asylum seeker with the local culture. We also refer victims to other volunteer service providers and specialty clinics in the community. Mr. S., 35 years old, comes from Iran and he is in Cyprus since 2005. In his country, he was arrested three times because of his political activity. During these arrests, he was tortured and in particular, underwent non-systematic beatings, was raped several times and received electroshock in different parts of his body. Through URVT, he was examined by a general doctor, received legal advice and had sessions with the psychologist of the UNIT. Moreover, he received guidance by the social counsellor regarding his rights, found housing, and was referred to community services. Mr. K., 45 years old, comes from Iran and came to Cyprus in 1997 with his brother. In his country, he was arrested two times as it was considered that his action was in opposition to the government. During these arrests, he was kept in a small room, underwent non-systematic beatings, was given unsanitary food and was present at mock executions. Through URVT, he was examined by a general doctor, received legal guidance and psychological support. In addition, a certificate was prepared by the multi-disciplinary team of the Unit supporting the stand that he is a victim of torture. Mr. A., 35 years old, is Kurdish from Syria and came to Cyprus in 2005. In his country he was arrested due to being involved in a political party considered to be in opposition to the government. He was arrested 7 times. During those arrests, he was tortured. He underwent non-systematic beatings while being blindfolded, “falanga”, “magic carpet”, electroshocks to sensitive and erotogenic body-parts, forced standing, movement and food restriction, detention in isolation, confinement in small places, forced partial nakedness. During his detainment, he was verbally assaulted and suffered threats against him and his family. Through URVT he received a specialised examination by a doctor, legal advice and psychological one-to-one support. Mr. A. is a recognised refugee now and he is still receiving social support and psychological services from the Unit. Mr. M., 36 years old, is Kurdish from Turkey and came to Cyprus in 2005. He was arrested 3 times due to his political action and involvement in a group considered to have act against the government. For the duration of those arrests he was tortured. He underwent systematic beatings, electroshocks to erotogenic and sensitive body-parts, forced nakedness, movement restriction, he was hanged upright, and did not receive medical attention when needed. A certificate was prepared by the multi-disciplinary team of the Unit supporting his application as an asylum seeker in Cyprus. The reply regarding his refugee status is pending by the Reviewing Authority. However, he is still receiving social, legal and psychological support from URVT. Dr. Elias Papadopoulos is the Medical Director at the Unit for the Rehabilitation of Victims of Torture. He holds a Bachelor of Medicine (Aristotelion University of Thessaloniki, Greece), he was specialized in General Surgery and in Pediatric Surgery, he attended a post graduate program of Emergency Medicine and he was trained on Victims of Torture by the Medical Rehabilitation Centre of Torture Victims (MRCT) in Athens. From 2001 until 2008 he was the President of the Non-Governmental Humanitarian Organization ‘Medecins du Monde – Cyprus’. Dr Papadopoulos is also member of the Board of Directors of the Medical Association of Lefkosia – Kerynia “Hippokrates”, of the Cyprus Association of Paediatric Surgeons and of the Refugee Association “Lapithos”. Dr. Ioanna Katsounari is the Supervising Psychologist at the Unit for the Rehabilitation of Victims of Torture. Ioanna obtained her Bachelors degree in Psychology in the UK, followed by post-graduate studies in Clinical Psychology in Chicago. She has extensive clinical experience working with children, families, and adults in community and hospital settings in Chicago, Illinois. Ioanna completed her doctoral internship within an Illinois State inpatient psychiatric hospital where she provided short-term individual and group psychotherapy to residents in acute and long-term psychiatric units. She has worked with survivors of torture both in the U.S and Cyprus. Her research interests include PTSD related to war, torture, and forced displacement, affective and anxiety disorders, psychotic-spectrum disorders, social exclusion and migration. Constantina Christou started working at the URVT in May 2009. She is an Integrative Psychotherapist, meaning that she utilizes Cognitive Behavioral Therapy and the Person-Centered Approach during the psychotherapeutic sessions. She graduated from Suffolk University in Boston, USA with a BA in Psychology and she received her Master’s in Integrative Counseling Practice from the University of Derby in the UK. She has experience in working in various fields including Depression, PTSD, General Anxiety Disorder (GAD), Anger management, Bereavement, Domestic abuse, Sexual abuse, Substance abuse, Obsessive Compulsive Disorder (OCD), Panic Attacks, Attachment Issues, and Self-harm. Constantina is also interested in advocacy and research regarding matters concerning Psychotherpay, forced migration, refugees, asylum seekers and human rights. Andria joined the FWC team in April 2008. She is the social advisor for the ERF-funded project entitled ‘Unit for the Rehabilitation of Victims of Torture’. Her duties include offering advice and addressing the client’s social needs such as housing, employment, education and integration, as well as liaising with competent authorities for meeting the above needs. Andria holds a Bachelors degree in Sociology from Aegean University (Greece) and an MSc in Criminology and Criminal Justice from University of Surrey (UK). She is currently attending a training on Addiction Counselors, organized by KENTHEA I.C.Ε (Institute of Continuous Education) in co-operation with the University of Cyprus. She also trained as a counselor for victims of domestic violence and she is a volunteer in relevant non-governmental organization. Corina is the part-time Legal Advisor of the Unit and the legal advisor of the UNHCR funded program ‘Strengthening Asylum for Refugees and Asylum-seekers in Cyprus, which is also under Future Worlds Center’ since 2005. Mrs Drousiotou holds a Bachelor in Law (Aristotelion University of Thessaloniki, Greece) and a Master in International and European Trade Law (University of Leicester, UK). She was trained by UNHCR in Cyprus on Refugee Status Determination procedure, on Second Instance reviewing of Asylum Claims and participated at a workshop organized by UNHCR in Rome about ‘Gender, Age and Diversity Mainstreaming’. Vicky is the project coordinator of the Unit and joined URVT on May 2010. She holds a Bachelor of Arts in Political Science & Public Administration (University of Athens), a Master of Arts in International Relations (University of Indianapolis), a Master of Arts in Human Rights & Democratisation (University of Malta) and is a PhD Candidate in International Human Rights Law at the Irish Center for Human Rights (National University of Ireland, Galway). She has worked as a doctoral fellow and researcher in Ireland and as a legal advisor in the UNHCR funded program ‘Strengthening Asylum for Refugees and Asylum-seekers in Cyprus’, which runs under Future Worlds Center. She was trained by UNHCR Cyprus Representation on Refugee Status Determination procedure (preparation, interviews, assessment), RSD monitoring, resettlement procedure and legal advising on individual cases/complains. Larry began with FWC in 2005 as a graduate student intern from Portland State University. From 2006-2008 he performed the duties of Project Coordinator and Program Developer. In 2009 Larry became the Head of the Humanitarian Affairs Unit which implements the projects "Unit for the Rehabilitation of Victims of Torture" and the "“Strengthening Asylum for Refugees and Asylum-seekers in Cyprus” as the implementing partner of UNHCR in Cyprus. Larry also acts as media consultant/expert for FWC because of his long history working in media related matters. URVT emerged under the European Refugee Fund (ERF) II - programme period 2005 – 2010. In particular, URVT was established in June 2006, after a collaboration of the Cyprus Neuroscience & Technology Institute (CNTI) with the Medical Rehabilitation Center for Torture Victims (MRCT) in Athens. The latter offered the training for URVT’s first staff and assisted in its preparation. The actual operation of URVT started with the second ERF grant that was provided in January 2007, funding which was also obtained in 2008. URVT currently runs under a new grant awarded by the Asylum Service, Ministry of Interior, within the framework programme of the European Refugee Fund on “Solidarity and Management of Migration Flows” for the period 2008-2013. This fund is covered 75% by the European Refugee Fund and 25% by the Government of Cyprus and is to be concluded on 30th June 2010. The Unit also receives since May 2009 a supplementary fund from the United Nations Voluntary Fund for Victims of Torture (UNFVT), which aims to support and promote the empowerment and rehabilitation of torture victims with a focus on refugees and asylum seekers. This fund is to be concluded on 1st June 2010. Future Worlds Center (leg. reg. Cyprus Neuroscience & Technology Institute – CNTI) is one of the six European partner organizations [Zebra: Intercultural Centre for Counseling and Therapy (Austria), ICAR Foundation: Medical Rehabilitation Centre for Victims of Torture (Romania), Association Primo Levi: Treatment and Support for Victims of Torture and Political Violence (France), ARQ/Equator Foundation (EF) (The Netherlands)] who are currently involved in the project: “Promotion and dissemination of good practice in addressing specific needs of vulnerable groups – especially victims of torture and human rights violations – based on a transnational in-depth study and evaluation of working and treatment methods”. This project, which is coordinated by Bundesweite Arbeitsgemeinschaft der Psychosozialen Zentren für Flüchtlinge und Folteropfer - The German Association of Psychological Centres for Refugees and Victims of Torture (BAfF), is funded by the European Commission – European Refugee Fund Community Actions 2009 and its duration is 18 months, 01/06/2010 – 30/11/2011. Aim of the project is to achieve an assessment on how exactly the centres work and, in collaboration with academic institutions, to create out of that knowledge norms for a common approach. Over the last three decades, vulnerable refugees including victims of torture have been treated in psycho-social and medical treatment centres all over Europe. These centres take a holistic approach, offering medical and psychological care, legal advice and social assistance to torture survivors; they train health personnel in order to increase the quality of the treatment and rehabilitation services offered, as well as organising structures for mentoring and voluntary work to support their beneficiaries’ integration into the host society. The centres are mostly organized as independent non-governmental organisations (NGOs) with a very broad range of available working methods and extensive experience, variety and knowledge. 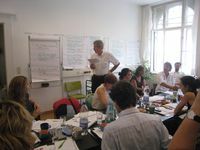 The project addresses the issue of ensuring staff remains able to contribute effectively to the work of the centres, combining the given expertise with a participatory evaluation and research model that allows for the practitioners to share their expertise in a discourse with professional research, while addressing the specific needs of vulnerable groups among asylum seekers using the synergy effects of diversity. Accordingly, Good Practice (Torture Victims) project, seeks to develop a common approach within the EU on the specific needs of most vulnerable groups, especially those who have undergone torture or other severe human rights violations. a) which methods have proved to be good and effective? c) does the use of a participatory self-evaluation method ensure that research is based on practical experience? This project continues a pilot cooperation which is currently being funded by the EU as project JLS/2007/ERF/007 “Good Practice in Torture Care”. The new project, including six institutions in different regions in Europe, is based on recommendations that emerged from the existing cooperation. • the conclusions will be presented at the European Network conference of the specialized centers (involving approx. 80 participants from 25 countries) and there will be a final symposium, which will take place in Cyprus. On June 04, 2010 Mrs Elise Bittenbinder, Psychopherapist, XENION, President of BafF and Chairperson of the European Network of Rehabilitation Centers for Survivors of Torture, who is the coordinator of this project and PD Dr. David Becker, Director of the Office for Psychosocial Issues (OPSI), Vice President of the International Academy (INA) at the Free University of Berlin that is the Internal Evaluator of this project, visited our organization in order to meet, discuss and introduce the project. This was a full day event at which all staff of URVT, along with the Head of the Humanitarian Affairs Unit and Director of CNTI/FWC participated. The day included the context of self-evaluation and outcome mapping; introduction to methodology as well as practical experiences; introduction to empowerment analyses and significant change (guiding imaging to identify typical key problems in field work); discussion on significant learning issues/aims in URVT; and further steps of cooperation within the project. 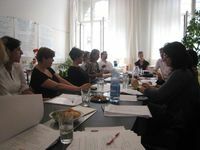 On July 04-06, the Kick-off meeting of the project took place in Graz and it was hosted by Zebra organization. All partners, along with the internal and external evaluators attended and it meant the official beginning and coordination of the project. The 3-days meeting included an overview and discussion of the project operational plan; introduction to content of project plan; introduction of evaluators and their method: Possible use of self-evaluation method in making an inventory of care and treatment methods and staff care; discussion of the Team Days: agenda and how to link it to the inventory on care and treatment and staff care; introduction to questionnaire: discussion and development for study; introduction logical frame work for care and treatments/staff care; objectives of bi-national meetings; and planning for the future meetings: time, location. On October 17, URVT staff met at its premises in order to discuss and fill in the Framework for Assessing Quality of Working and Treatment Methods. 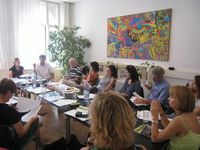 This day was introduced and guided by URVT’s coordinator and social counselor, the representatives of the project who had attended the kick-off meeting in Graz. The meeting included introduction, agenda of Team Day and Logic of the Framework; conflict analysis; analysis of desired outcomes/objectives; methods used; outcomes. Team Day I on care and treatment methods, under the self-evaluation method was conducted by all partner centres. Equator Foundation: 06.09.2010, Zebra: 27.09.2010, Xenion: 05.10.2010, ICAR Foundation: 11.10.2010, Primo Levi: 09.11.2010. On October 21, URVT’s representatives of the project met with the project’s researcher, Mrs Marie Thompson, who visited our organization in Cyprus [as part of her visits to all partner centers] in order to discuss the results and findings of Team Day I and self-evaluation method and further assist the establishment and completion of the Inventory of Working and Treatment Methods of URVT. Elia Petridou is credited for the creation of the Unit, Larry Fergeson for securing UNVFVT funding for many years and Corina Drousiotou for heading and stabilizing its operations. Many people supported the worked at the Unit. This page was last edited on 7 November 2017, at 12:57.